Experts and analysts broadly agree that the nuclear deal struck between the P5+1 (China, France, Germany, Russia, the United Kingdom and the United States) and Iran on July 14 will effectively and verifiably block Iran’s potential pathways to nuclear weapons for 15 years or more. Absent the agreement, Iran’s capacity to enrich uranium could rapidly increase and sharply reduce the time it would take Iran to produce enough fissile material for a nuclear weapon. 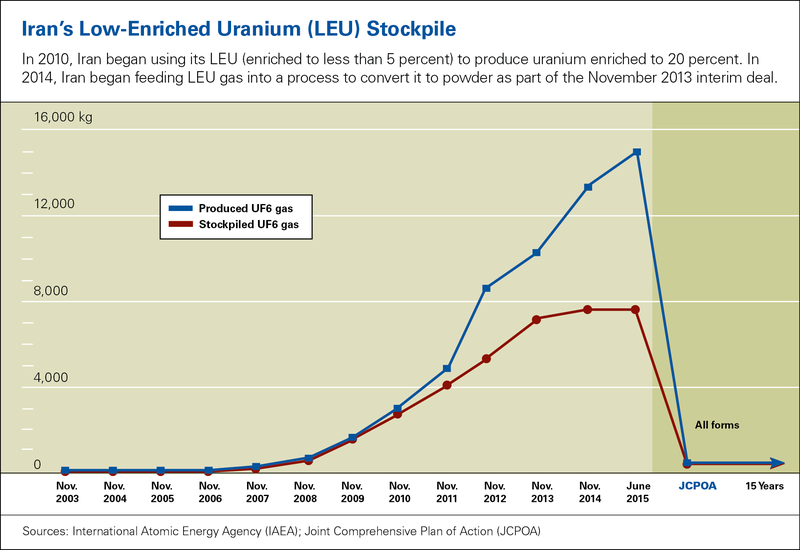 Although several key restrictions on Iran’s uranium-enrichment capacity and its stockpile of enriched uranium will expire after 15 years, the deal—known as the Joint Comprehensive Plan of Action (JCPOA)—establishes several other restrictions and tools that will help constrain and provide deep insights into Iran’s nuclear program far beyond the first 15-year period. Taken together, these additional restrictions and transparency measures will provide the international community with a powerful set of tools to promptly detect and deter an Iranian attempt to pursue nuclear weapons well beyond the initial 15-year period. 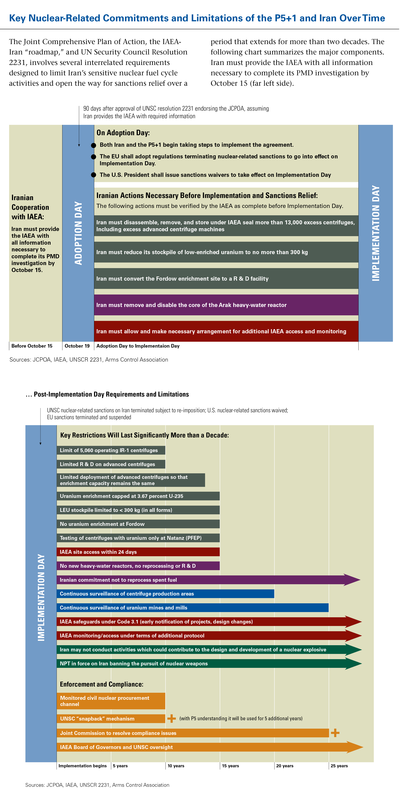 To reinforce the JCPOA in the out-years, the United States, its P5+1 partners, and other countries in the region can and should make the most of the time provided by the JCPOA to pursue additional measures that would decrease Iran’s incentive and its justification for expanding its indigenous uranium-enrichment program and also guard against the pursuit of dangerous, dual-use nuclear fuel cycle activities by other states in the region. This issue brief describes some of these options as well as the JCPOA restrictions that will help bound Iran’s nuclear capabilities 15 years after the implementation of the deal. After 15 years a number of intrusive monitoring and verification mechanisms remain in place that will give the international community a clearer picture of Iran’s nuclear program and an early warning if Iran intends to increase its enrichment capacity. The IAEA will be able to continuously monitor Iran’s production of centrifuges for 20 years and it will be able to continuously monitor uranium mines and mills for 25 years. Taken together, the continuous surveillance on these elements will help ensure that the IAEA and the international community will be aware of Iran’s capabilities and resources, allowing for assessment of how quickly Iran could ramp up its program and produce enough material for a nuclear weapon. Even after these restrictions sunset, the deal puts in place a more intrusive inspections regime as compared to what Iran is currently subject to by the IAEA. Implementation, and eventual ratification, of Iran’s additional protocol will allow for short-notice inspections at all of Iran’s nuclear facilities. Inspectors can access Iran’s declared nuclear facilities in as little as two hours if they are already on site. This is particularly important for monitoring Iran’s uranium-enrichment facilities. The expanded nuclear declaration under Iran’s additional protocol will include more facilities than are counted under Iran’s current comprehensive safeguards agreement—such as the uranium mines and heavy-water production plant. Iran’s additional protocol, once ratified, is permanent. Iran voluntarily implemented it between 2003-2006, but did not ratify the document. The JCPOA requires Iran to seek ratification within eight years. As part of the JCPOA, Iran will also implement modified Code 3.1 to its safeguards agreement. Under the terms of Code 3.1 Iran must notify the IAEA when it decides to build a nuclear facility (rather than simply six months prior to introducing nuclear material) and provide updates on the design of existing nuclear facilities. This will give the IAEA additional warning if Iran intends to expand its nuclear program, and adjust the safeguards approach accordingly. The IAEA's ability to request access to undeclared sites to investigate concerns about illicit nuclear activity is also permanent under Iran’s additional protocol. Without the JCPOA, which ensures ratification of Iran’s additional protocol, the IAEA will have no mechanism to request access to undeclared nuclear sites to check for illicit activities. Under the Model Additional Protocol, if the agency has concerns about a particular site the agency will provide that country with the reasons for its concerns. The country must then respond to the IAEA’s request. If the explanation does not satisfy the IAEA, it can request access to the site. Under its additional protocol, Iran, like any other country, can take some steps to protect sensitive information if, for instance, the inspection is on a military facility. But ultimately, it is up to the IAEA to determine if the access is sufficient. The IAEA can refer the case to its Board of Governors and the UN Security Council if it unsatisfied with Iran’s compliance. Iran also agreed to permanent restrictions prohibiting activities relevant to developing a nuclear explosive device under the JCPOA. While Iran committed not to pursue nuclear weapons when it joined the nuclear Nonproliferation Treaty (NPT), the JCPOA commits Iran to adhere to restrictions beyond its NPT obligations. The NPT does not explicity prohibit research or use of explosives suitable for nuclear weapons for non-nuclear purposes. Iran has asserted that some of its past activities with possible military dimensions (PMDs) that the IAEA has been investigating were for non-nuclear weapons purposes. Under the deal, however, Iran can no longer make this dubious claim. Iran agreed to forgo computer modeling to simulate nuclear explosive devices, testing, developing, or acquiring multi-point explosives and neutron sources, and development and designing of nuclear explosive diagnostic systems (Annex I Section T). While some of these activities are relevant for developing conventional explosives and for activities like drilling, in the future, if caught conducting research in these areas, Iran will not be able to claim it is undertaking any of these activities for non-nuclear purposes. The JCPOA also closes the door on the plutonium pathway to nuclear weapons indefinitely. As part of the deal, Iran said it never intends to reprocess spent fuel, the process by which weapons-grade plutonium is removed from spent reactor fuel. Iran also said it intends to ship out all spent fuel from any future reactors. The JCPOA is a strong, verifiable, agreement from a nonproliferation viewpoint, but the United States, along with its P5+1 partners and countries in the Middle East, can and should take steps to further decrease Iran’s motivation and justification to significantly ramp up its enrichment capacity after 15 years. Civil nuclear cooperation between certain nuclear supplier states and Iran can and should be designed to ensure that Iran has assured access to the nuclear fuel for its research and power reactors so that Tehran has less of a “practical need” to significantly expand its uranium-enrichment program beyond the capacity allowed under the JCPOA for the first 10-15 years. Pursuing this strategy would prevent Iran from justifying increased enrichment capacity based on a need to domestically produce reactor fuel to ensure continuity of supply. Under the terms of the JCPOA, Iran will domestically fuel the Arak reactor, once the reactor is modified and Iran is able to produce fuel assemblies for the reactor. Iran’s enrichment capacity under the first 10 years of the deal, 5,060 IR-1 centrifuges, is more than enough to provide fuel for the reactor on an annual basis. Iran claims that it wants to provide fuel for its power reactor at Bushehr, which is currently supplied by Russia. That would require the equivalent of over 100,000 IR-1 centrifuges. Any country that enters into a contract with Iran to supply additional power reactors could provide fuel supply guarantees for the lifespan of the reactor, and arrangements to take back the spent fuel so as to deny Iran access to the unseparated plutonium in the spent fuel. Iran’s current memorandum of understanding with Russia for the provision of additional power reactors at the Bushehr site already includes this kind of arrangement. If necessary, to provide additional assurances that there will be no fuel supply disruption, Russia could deliver to Iran enough fuel for several years at a time. Fuel could be stored under IAEA seal until it is used. China is also currently in discussions with Iran about supplying nuclear power reactors and should be strongly encouraged to ensure that any reactor contracts include lifetime fuel supplies and spent fuel removal arrangements. This example could be employed region-wide to decrease the incentives of other countries considering nuclear power programs from pursuing enrichment. The United States and its P5+1 partners should also work to ensure that the IAEA fuel bank, is fully funded and supplied. Kazakhstan and the IAEA will sign an agreement establishing the fuel bank on Aug. 27, 2015. The fuel bank is designed to ensure uninterrupted fuel supplies for nuclear reactors and prevent the withholding of fuel from supplier countries for political reasons. If for some reason Russia was unable or unwilling to supply Iran’s reactors, Tehran could obtain nuclear fuel from the IAEA bank. Iran has stated in the past that it would be willing to accept permanent enrichment restrictions, such as capping enrichment levels at reactor grade (enriched to less than five percent U-235), if other countries in the region agreed to similar restrictions. A regional commitment to forgo enrichment to higher levels could serve as a major confidence building measure against further proliferation in the region. Another possible confidence building measure could be to encourage all states in the region to commit to continuous IAEA monitoring, similar to what Iran agreed to for its nuclear supply chain, on key nuclear facilities region-wide. Another option for increasing regional confidence in the peaceful nature of Tehran’s activities would be to “multilateralize” Iran’s existing uranium-enrichment facility, providing regional oversight and nuclear fuel for countries pursuing nuclear power in the Middle East. Regional countries that invest in the enrichment facility would be able to have their personnel access and monitor the facilities, thus providing a greater degree of confidence that Tehran’s nuclear activities are peaceful and it could help prevent stockpiles of enriched uranium from accumulating in Iran. Regional inspections could also provide greater transparency and assurance that Iran’s nuclear program is peaceful. Brazil and Argentina, both of which pursued nuclear weapons programs and now have domestic uranium enrichment, have a bilateral inspections agreement known as the ABACC arrangement (Argentina-Brazil Agency for Accounting and Control of Nuclear Materials), which augments the standard IAEA safeguards system for those states. Despite the checkered past of both countries in nuclear weapons research, the bilateral inspections help provide assurance that neither country is currently pursuing nuclear weapons. 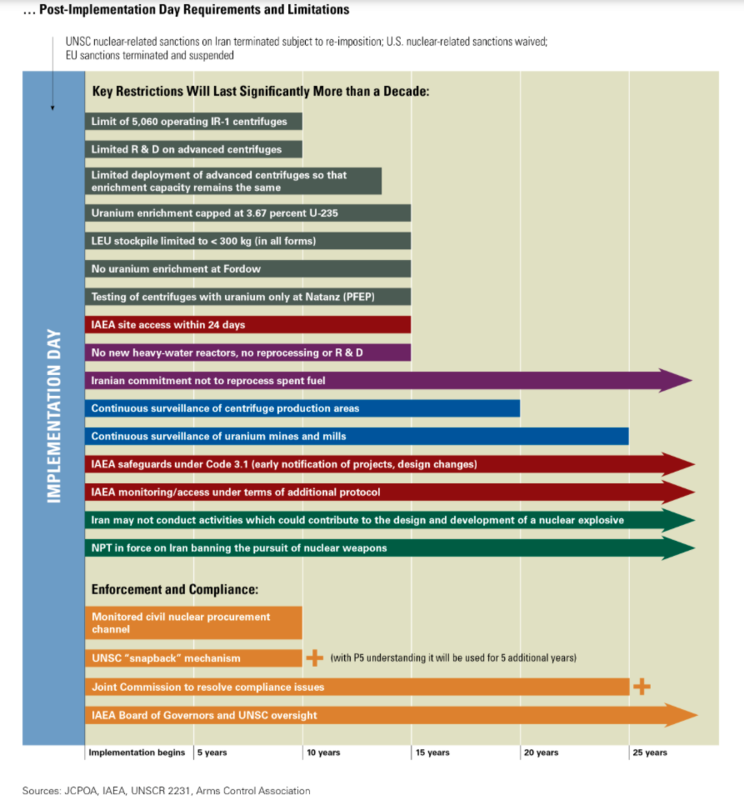 While some of the restrictions on Iran’s uranium-enrichment capacity expire after 15 years, other measures remain in place, some of which are permanent. The United States, it P5+1 partners, and countries in the region also have a number of options to strengthen the deal and dis-incentivize Iran from ramping up its uranium enrichment 15 years after implementation of the JCPOA. If Congress rejects the deal, Iran’s nuclear program will be free of the long-term restrictions and more intrusive monitoring system mandated by the JCPOA.